Textile testing is an important field of textile sciences involving experimental evaluation of conventional as well as technical textile products. 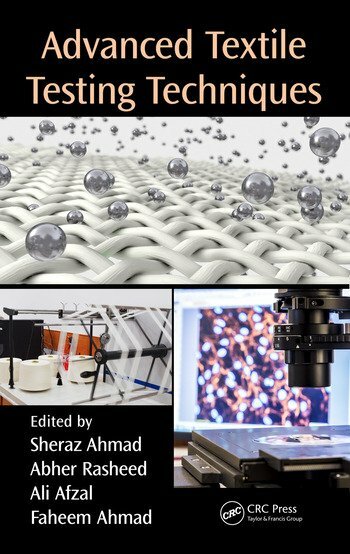 This book aims to provide technical details, required protocols and procedures for conducting any specific evaluation test along with key parameters. The book covers the topics in two main sections, first one for the conventional textile testing techniques starting from fiber to final product while the second one focusses on testing of technical textiles. Addresses all techniques for testing both conventional and technical textiles. Describes testing techniques compliance with the latest requirements of the updated EN ISO and AATCC standards. Provides detailed description on the testing of technical textiles and their products. Discusses the operations conditions, like atmospheric conditions, and human error with cause and effect diagrams. Covers both destructive and non-destructive testing. Dr. Sheraz Ahmad Master in Fibre Technology from University of Agriculture, PhD in Textile Engineering with focus on textile materials from Université de Haute Alsace France. Working as Assistant Professor at National Textile University since October 2012, chairman of materials & testing department, teaching undergraduate, MS and PhD level classes and doing research on textile fibres, conductive yarn and recycled materials, have authored over 13 peer-reviewed journal articles, two books and 8 conference communications. Fluent in English, French, Urdu and Punjabi, experienced in developing course curricula as well as executing field trips, laboratory exercises, and other activities beyond traditional lectures. Dr. Abher Rasheed is an Assistant Professor at National Textile University, Pakistan. He is a textile engineer. Further, he has completed Masters in (Textile Materials and Processes) & Masters in (Total Quality Management). In addition to that, he received his Ph.D from University of Haute Alsace, France in the domain of SMART Textiles. His research areas are E-textiles, clothing manufacturing and quality management. He has filed one international patent and published 12 peer reviewed publications. Further, he has contributed a book chapter as well. Ali Afzal is the Lecturer of Material Science at National Textile University, Pakistan. He did his doctorate from Université de Haute Alsace, France in SMART textiles. He did his Master’s degree from National Textile University with distinction in 2012. He published a number of research papers in high impact factor international journals. His research and teaching experience span over 5 years after having 1 year of industrial experience. His main research area includes melt extrusion, SMART textiles and clothing comfort. Mr. Faheem Ahmad is currently doing PhD in Materials Science & Engineering from Koç University Turkey. His primary area of expertise is textile materials. He is currently working to develop nonwoven composites for heat insulation applications. He is also performing his duties as a Teaching Assistant at Koç University Turkey. Mr. Faheem Ahmad has also worked as Lecturer at National Textile University Pakistan for more than five years. He has 09 international research publications. Mr. Ahmad also has the experience of working in textile industry of Pakistan.